*Our fabric comes on 9'wide rolls. Any 10' fabric can be ordered through us with our partner printer in China. Photo Pie's economical background material made of 100% polyester oxford cloth. Dye-sublimation printing gives it a vibrant, colorfast image while still making it machine washable/dryable. Since it is made for photography, image surface has a non-glare matte finish. Because of PrismaCloth's wrinkle-resistant nature, it can be stored folded, rolled, or stuffed in a bag/plastic crate. Comes with a top-side rod pocket, shipped folded. Similar to durable sweatshirt material (but not stretchy like sweatshirts), JerseyCloth backgrounds offer a seamless, machine washable, the most wrinkle-resistant, more affordable, alternative to InspiraCloth. 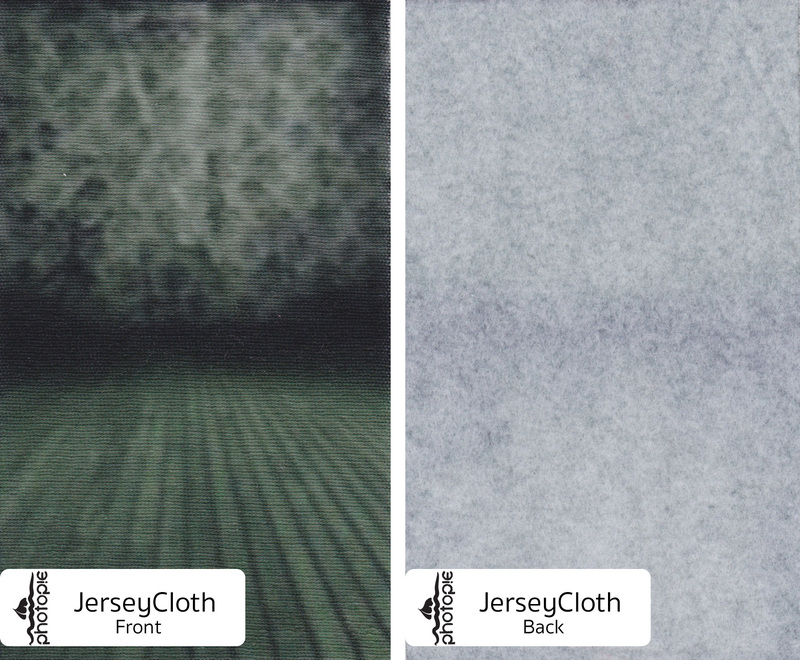 JerseyCloth is a 100% polyester heavyweight material with a soft, knapped backing. Dye-sublimation printing gives it a brilliant, colorfast image while still making it washable/dryable. Since it is made for photography, image surface has a non-glare matte finish. Because of JerseyCloth's wrinkle-free nature, it can be stored folded, rolled, or stuffed in a bag/plastic crate. Comes with a top-side rod pocket, shipped folded. Photo Pie's luxurious seamless, washable, wrinkle-resistant, background cloth. Double-faced satin made of 100% polyester fiber. Dye-sublimation printing method makes it machine washable and dryable, yet with rich, vibrant colorfastness. It is made for photography, so image surface has a non-glare, matte finish. 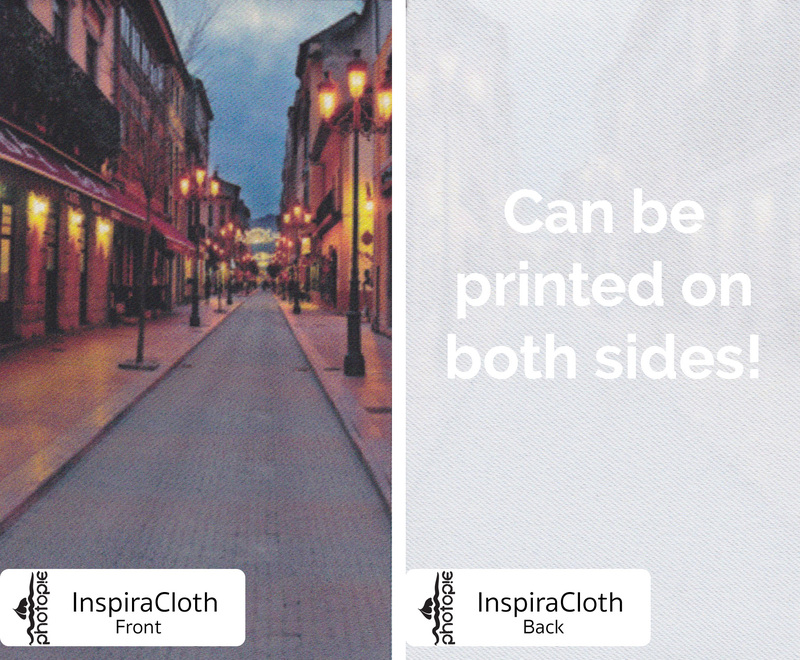 Because of InspiraCloth's wrinkle-resistant nature, it can be stored folded, rolled, or stuffed in a bag/plastic crate. Comes with a top-side rod pocket, shipped folded. Pole Pockets: All of our backdrops come with a standard 3" pole pocket across the top. We can add a complimentary pocket across the bottom if requested. Side pockets and grommets are not recommended but if needed we can give you a quote on those as well. Please note in some cases, rod pockets may slightly subtract from overall dimension of the image. By far, our most frequently asked question: "What is the difference in your cloth types?" We've remade this video two or three times as we've made improvements and released new cloth types. This video serves as a concise reference for differentiating our three backdrop cloth types: PrismaCloth, JerseyCloth, and InspiraCloth. Hi. 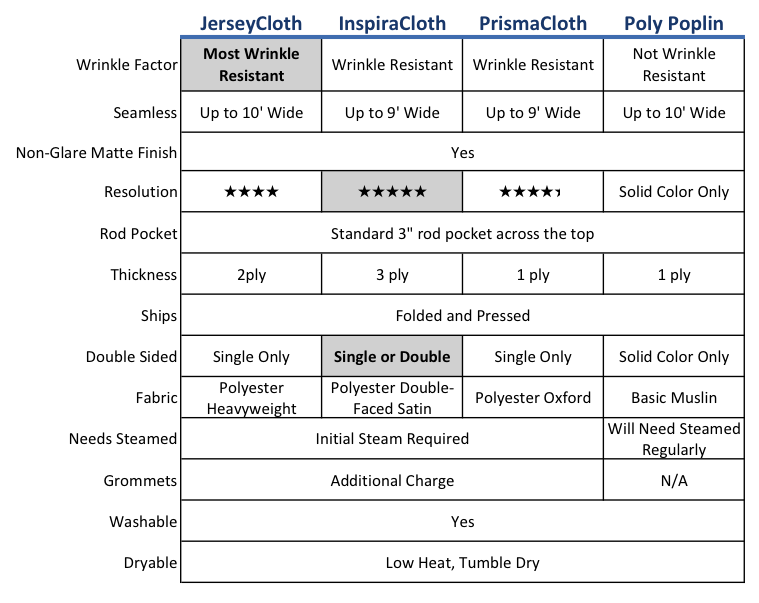 Our number one, most frequently asked question is, “What’s the difference between your three cloth types?” Here we have our JerseyCloth, our PrismaCloth, and our InspiraCloth. All three are photographically the same. So from the viewpoint of your eye from several feet back or from the view point of your camera, you shouldn’t be able to notice a difference. They’re all three, non-glare. And they are made so that they can look realistic like an on location setting. So if you light your subject and your background properly, you should not be able to tell between an on location shoot and a studio shoot. So all three are photographically the same if you light them correctly. The number one main difference is the feel and the touch of the fabric. Here we have our InspiraCloth and it’s a smoother satin weave. So to some people (in their opinion) it has a sort of more luxurious feel. It also may be slightly more static-y, so if you have a low-grade commercial pile carpet it may have a little more cling to that type of surface. So it has a smoother, more luxurious feel. The PrismaCloth is sort of a mid range feel. It’s a polyester, linen type of weave. And it’s very sufficient. You’re not going to feel that it’s rough, it’s just not as smooth as the InspiraCloth. And the JerseyCloth by far is the softest. It’s like a sweatshirt type material. You can even see on the inside, on the backside of the JerseyCloth, it’s like you would see on the inside of a sweatshirt. And so JerseyCloth is by far the softest and I would say that InspiraCloth is by far the smoothest. The second main difference between the three cloth types is the wrinkle resistance. All three of our cloth types are wrinkle resistant. JerseyCloth is the only one which I would say is technically wrinkle-free. You can really try to bunch it and wad it up all day long and even though you try to impose wrinkles upon it, hardly ever will you ever be successful in actually making wrinkles. So JerseyCloth is wrinkle free. The other two are wrinkle resistant. And when I say wrinkle resistant, it’s still very easy to maintain. The only thing you have to do is throw it in the dryer for 10-15 minutes with a wet cloth or a wet towel and the wrinkles should pop right out. So then you would just be ready to go. So JerseyCloth is actually wrinkle free. The other two are wrinkle resistant but still really low maintenance. And the other main difference is the touch and the feel. If you would like free cloth samples, please email us atphotopiebackdrops@gmail.comor we have afree cloth sampleproduct in our supplies category. You can just fill out your name and address and your contact info, and we will send that to you free of charge so that you can actually feel it yourself. But if you have a short deadline, I would just say, go ahead and place your order. All three cloth types are great. Go with your gut. And we’ll send you free cloth type samples with your order. And so the next time you can have a feel and a touch of those and know exactly what you want. But I don’t think there’s really a great reason to be hesitant about any of our three cloth types. All very realistic. All very low maintenance. All very versatile and functional in your studio. Every piece of cloth is a little different. 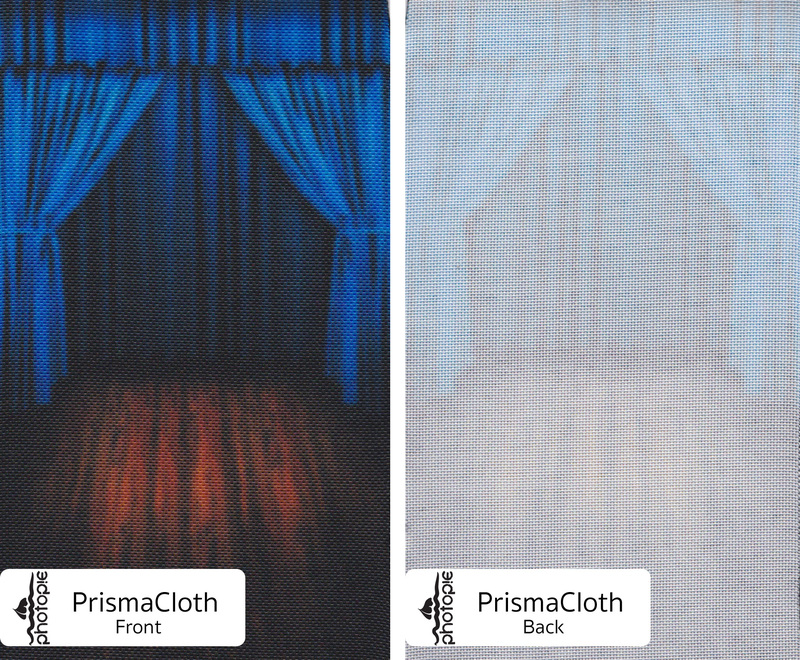 With the dye sublimation process, there's no way to predict the exact shrinkage of any backdrop. Our policy is that anything under 10% shrinkage in either direction is normal. Most often it's under 6" but sometimes it happens to shrink more. When measuring, please use a tape measure that can span the entire length and make sure that it's on a flat surface without any sag. If you need a backdrop to be an exact size, please purchase the next largest size so that we can cut/hem it to your specifications.